This is the calendar for the December One Year Bible Brick Challenge, and although you can jump in anywhere you like, you can also check out the list off all the One-Year Bible Brick Challenge calendars along with some tips on how to use it! NOTE: Please download all the calendars before the end of 2018. We’ll be bundling them all up and moving them into the store in January as a paid product. Here are the stories covered this month. We skipped a few of the shorter books so if you want a complete Bible survey you may want to skim through those with your kids. Revelation can be a little intense. I did skip some stories with that in mind, but if your older kids want to go through the whole thing, you can always take your time and go chapter by chapter, coming up with new challenges as you go. If you’d like to include some engaging questions and devotions, I recommend pairing this challenge with Bible Road Trip (the Bible curriculum we use) or 365 Great Bible Stories: The Good News from Genesis to Revelation, which is a great simple devotional for younger kids. Don’t forget to share your photos on Instagram and tag me at @tauna_phomemaker and tag #proverbialhomemaker and #biblebrickchallenge! Or you can email them to me at tauna (at) proverbialhomemaker (dot) com and I’d love to feature them on the Proverbial Homemaker Facebook page, here on the blog, or our Homeschool Successfully FB group. 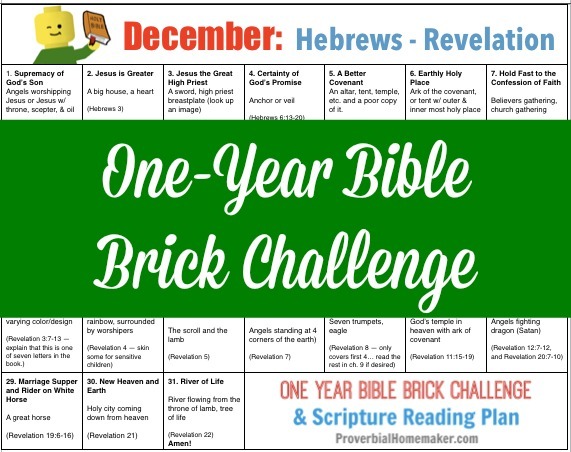 Download the December One-Year Bible Brick Challenge & Reading Plan! You will find all the Bible Brick Challenges on this page.